I love breakfast, provided it is served at 4 pm. Not eating in the morning and then working through till the late afternoon, is not a good thing. The other day, I got home late in the afternoon. I was not up for cooking and it was one of those days where there was nothing in the house. In the refrigerator, I had bits of this and that and dragged it out. The was about a cup of cooked rice from Sunday's chicken and rice. The was a small container of cooked squash leftover from the gigantic pot of squash that hadn't fit into freezer bags. There was a thumb-sized piece of grana padano. All together, I thought, it bore a striking resemblance to a risotto. I mixed the rice and the squash and cooked it till it was steamy. 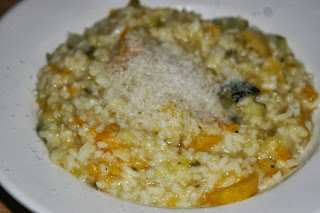 Then I finished it like a risotto, adding a dollop of half-and-half and a bit of grated cheese. I had a sliver of cheese left that I grated on top. It looked like risotto. It tasted like risotto. It took about 5 minutes. I would be willing to bet that there are only a handful of discerning diners who would have known he difference. I am thinking of trying it out on a larger scale. It's so satisfying to make a meal out of leftover odds and ends. Your risotto looks delicious.